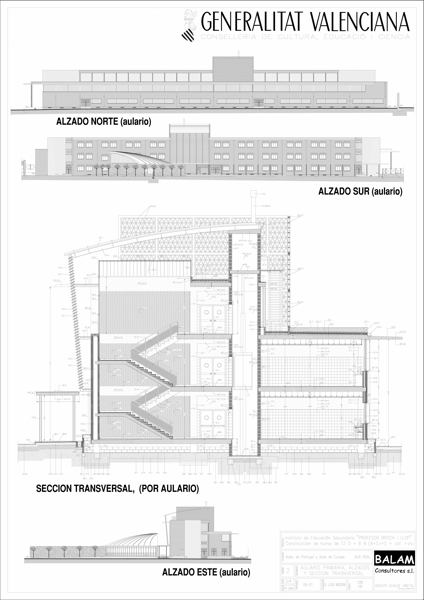 Public architectural competitions (public tenders) are one of the strengths of Balam Consultores since we have a great experience in project design and work management (works supervision) of projects funded by the regional or local institutions. 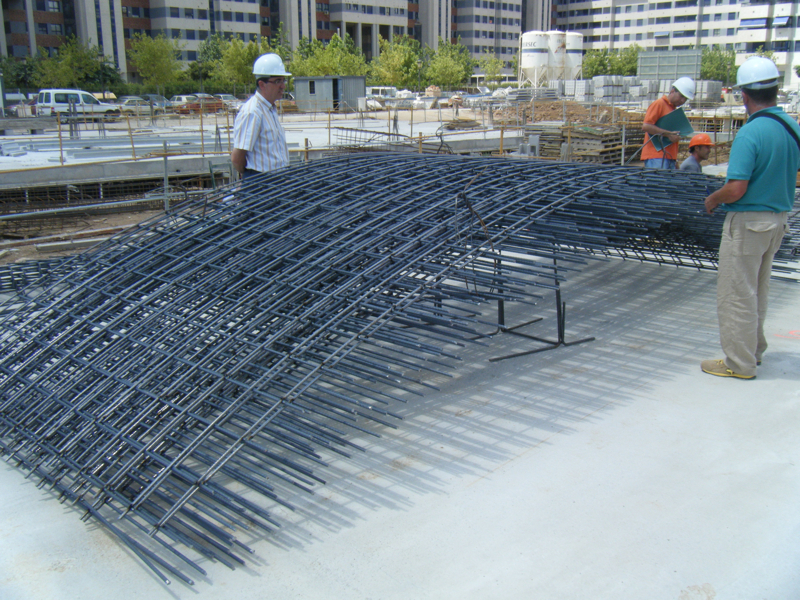 The ability to design good technical quality plans and to create three-dimensional images, which help to show the ideas very quickly, are essential for this kind of projects. 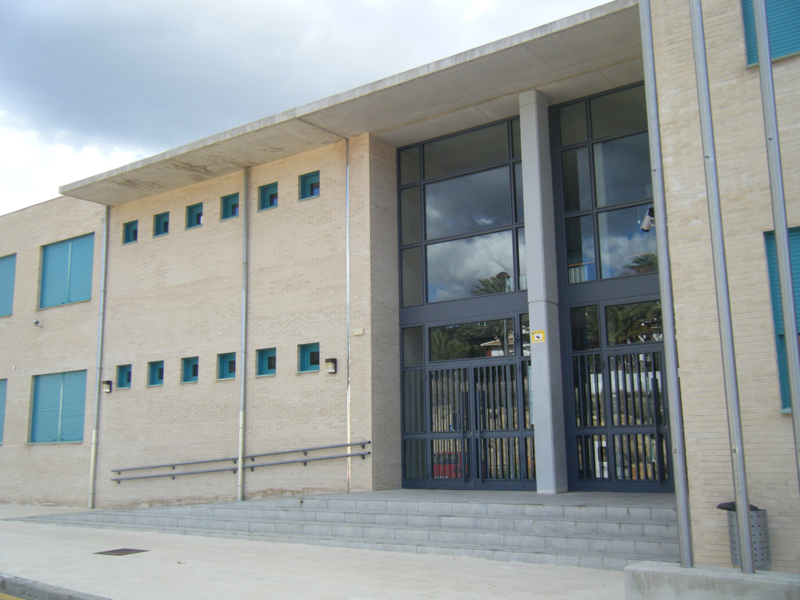 The knowledge of local laws is also indispensable. 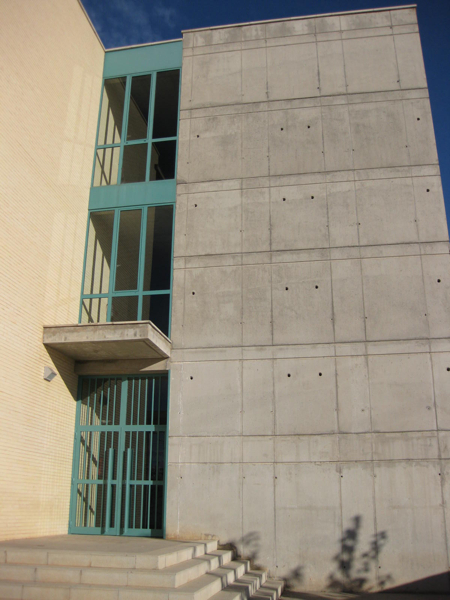 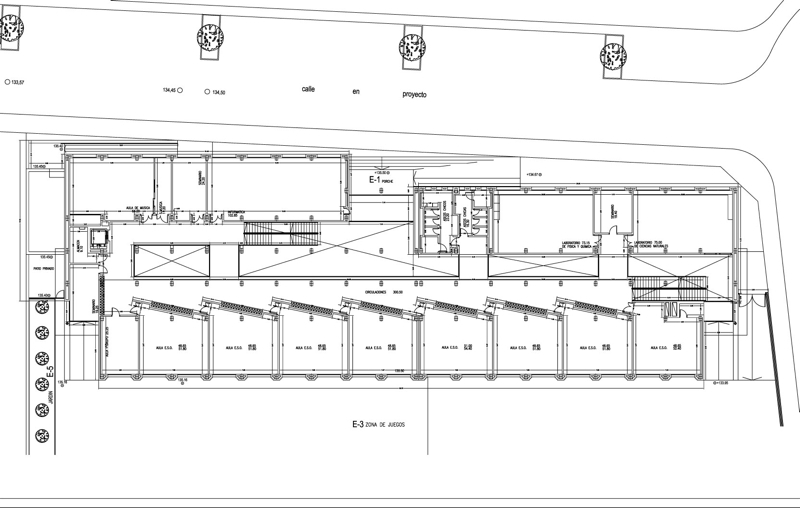 The main element of the project is a central volume that easily addresses the users towards the classrooms blocks, which are connected to the central box (like perpendicular wings). 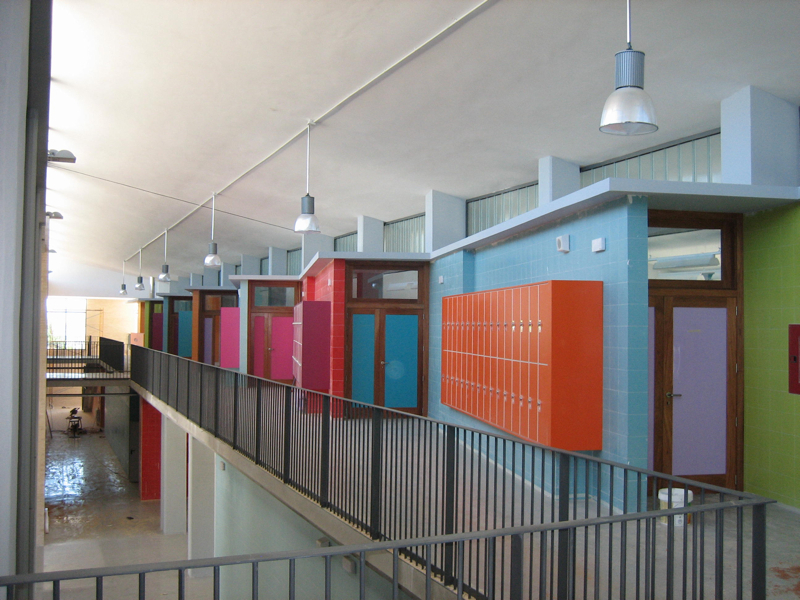 This kind of schools has special energy and heating needs. 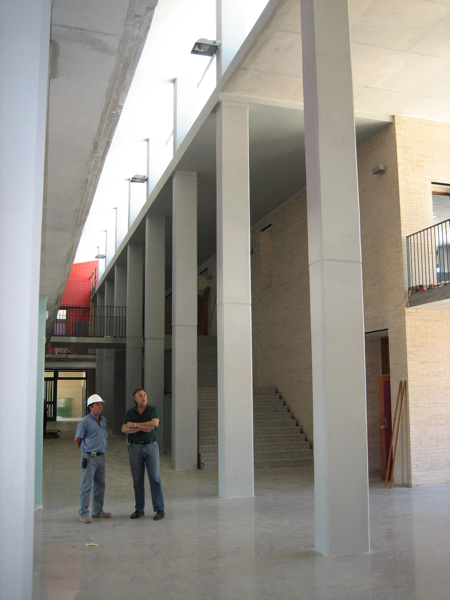 This is the reason why we have searched for design solutions adapted to these requirements. 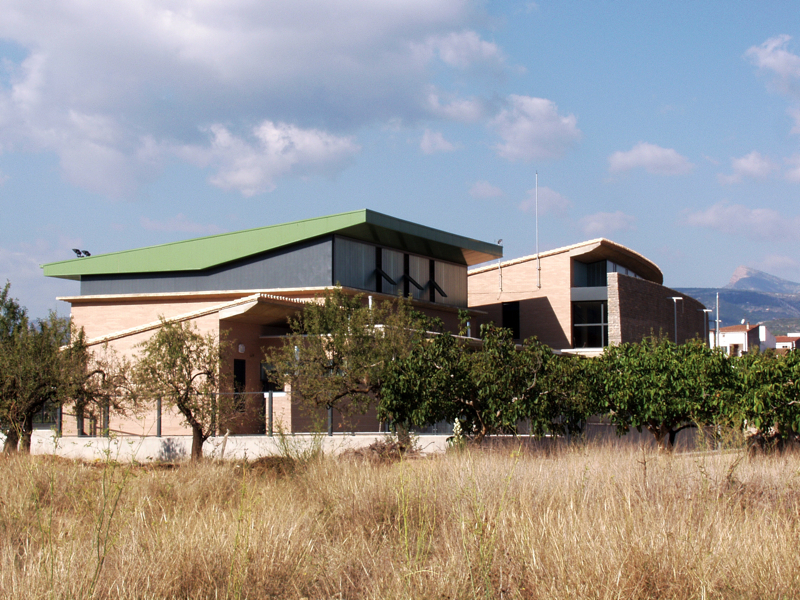 Several solar panels located on the central volume produce enough energy for the self-sufficiency of the school. 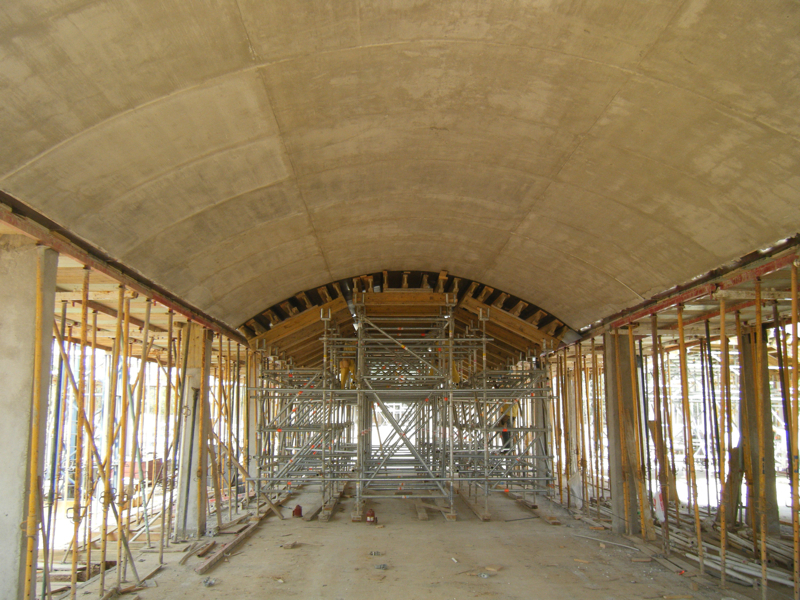 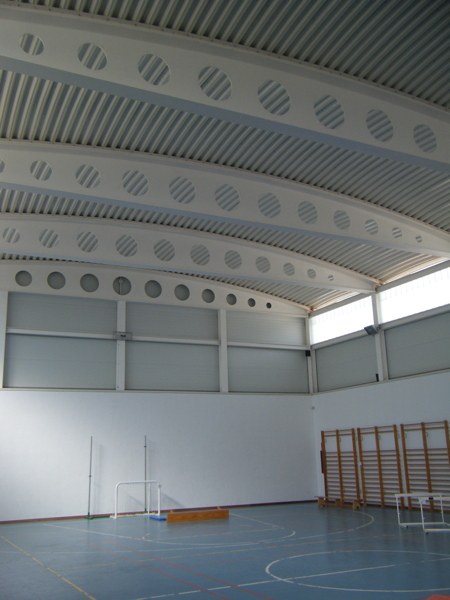 Moreover, the classrooms, which roofs are vaulted, preserve the heat. 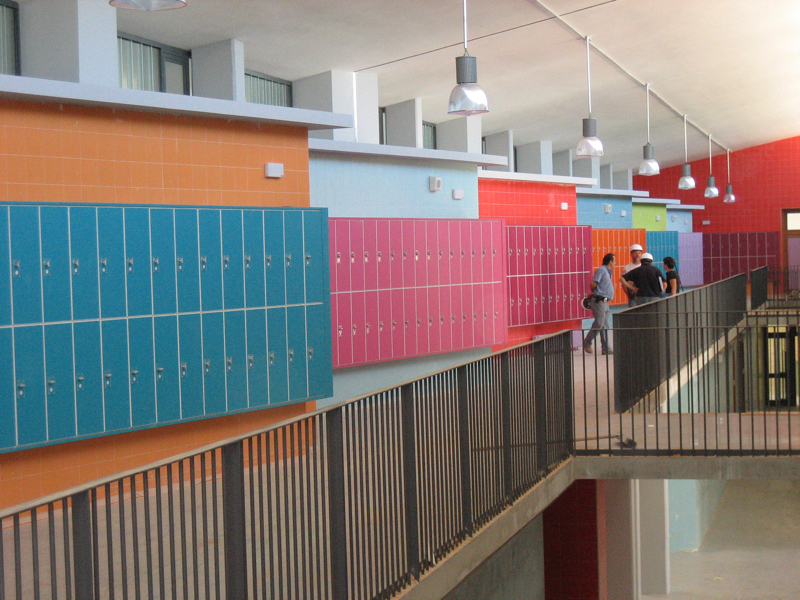 We gave colours to the inner spaces of this high school because the use of colours generates plenty of new sensations. 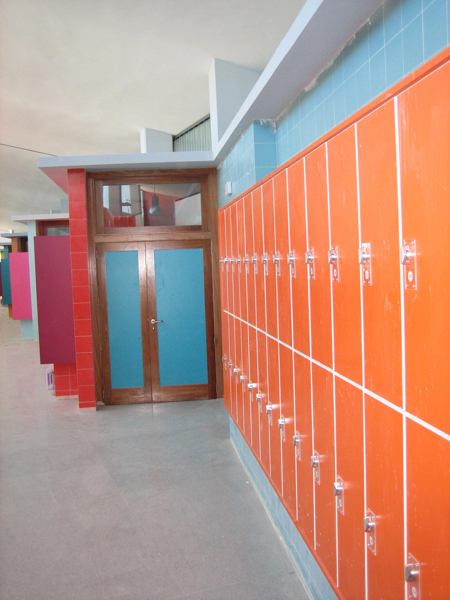 The students identify the colours of every classroom with the relevant teaching level. 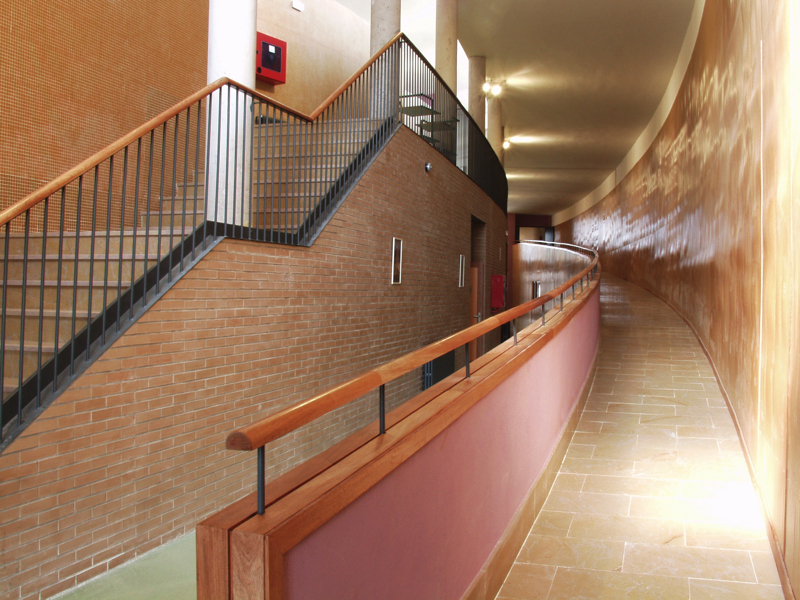 The double height space, which begins at the main door and proceeds through the corridors, is also remarkable. 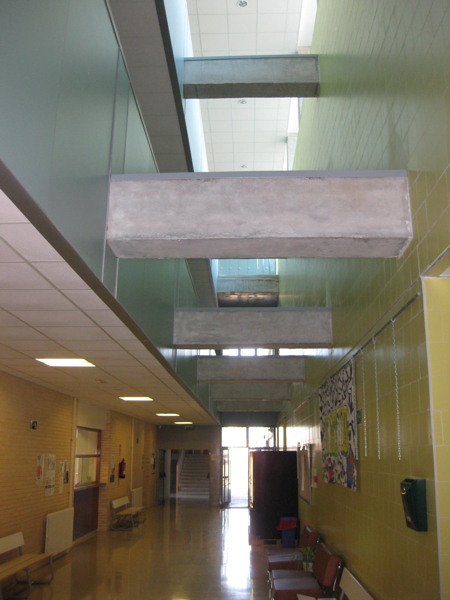 Finally, the school has a climatic system of crossing ventilation to avoid high energy consumption. 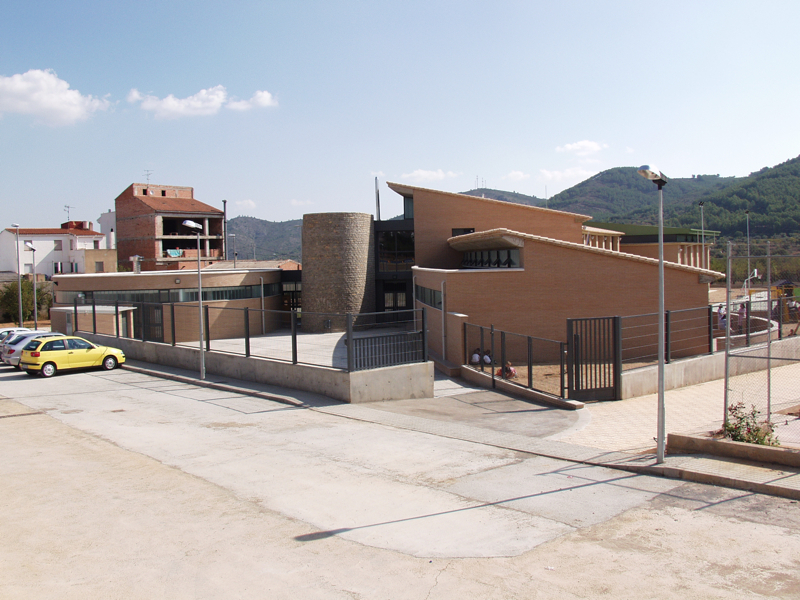 The construction of this high school stands out for its strong appearance and the huge volume of the gym at one of the corners of the plot as a reference point in the urban profile. 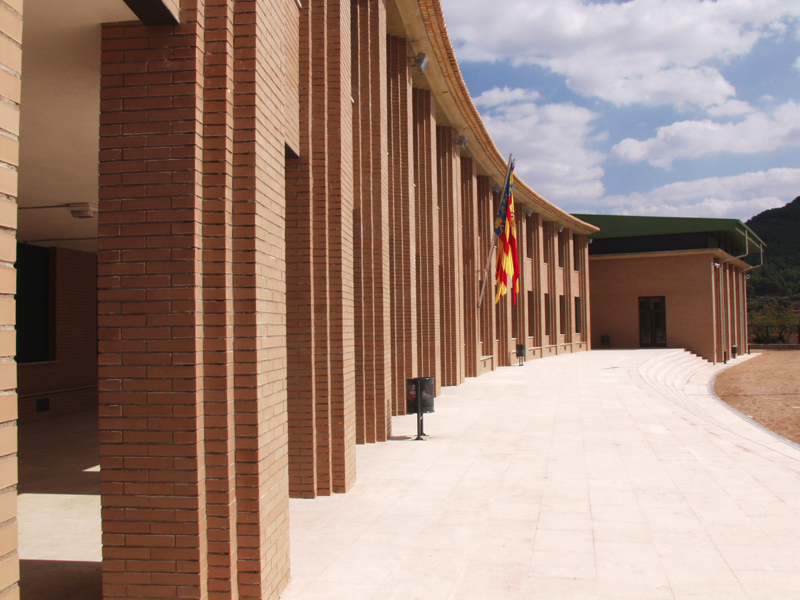 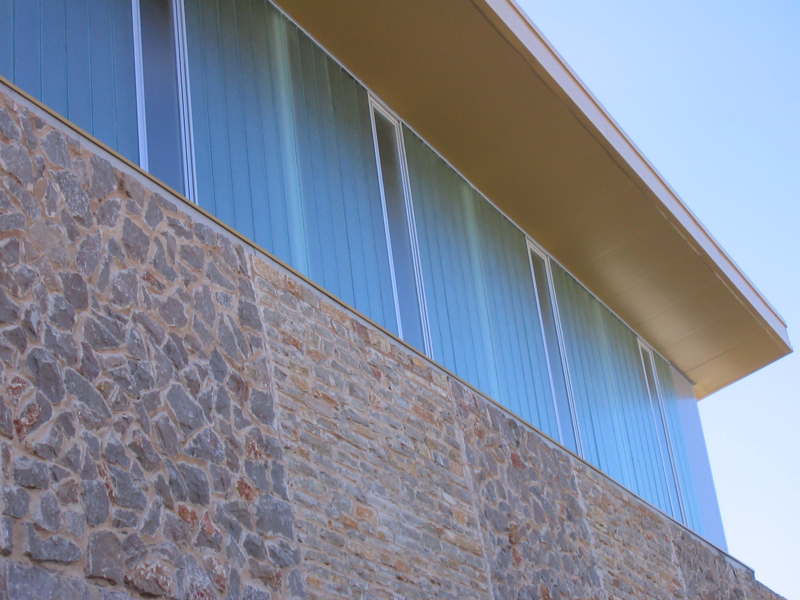 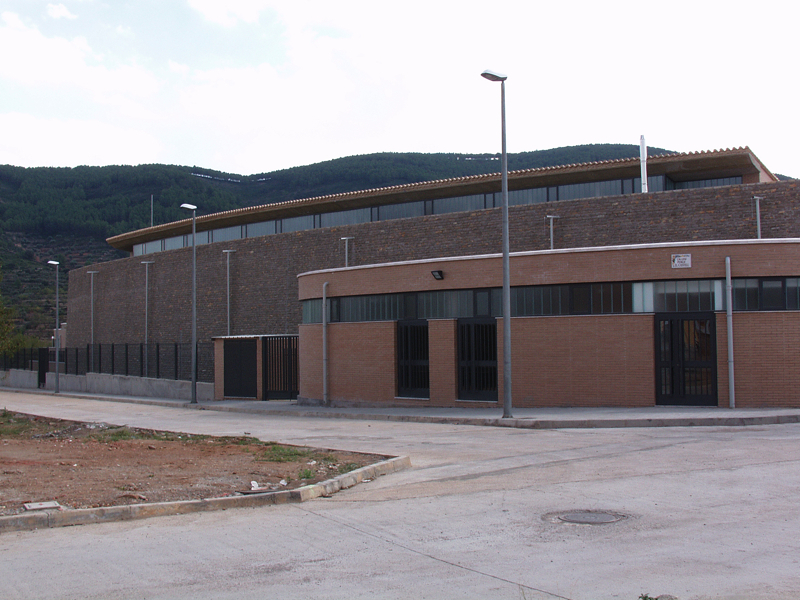 Moreover, its singular shape and the façade composition with different rhythms of stone construction make the school an example of a construction coherent with the materials from the site. 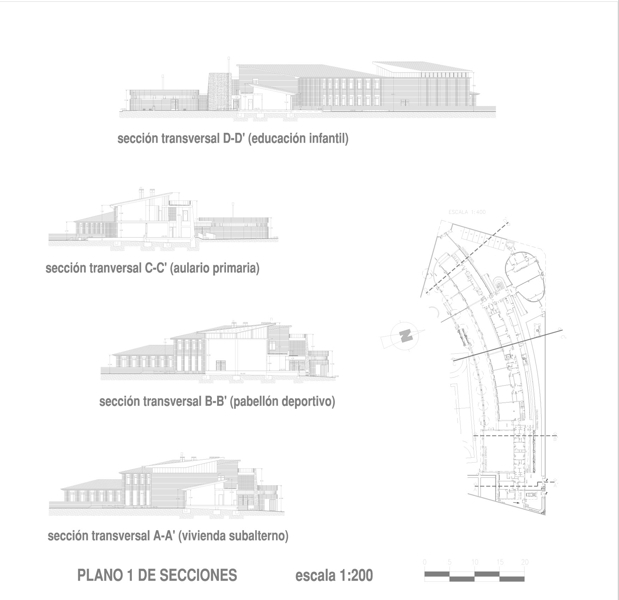 When you look at the school plan you can appreciate its bow form, in fact that form makes possible to orientate all views towards South, which offers to the centre add the views of the surrounding trees to the project. 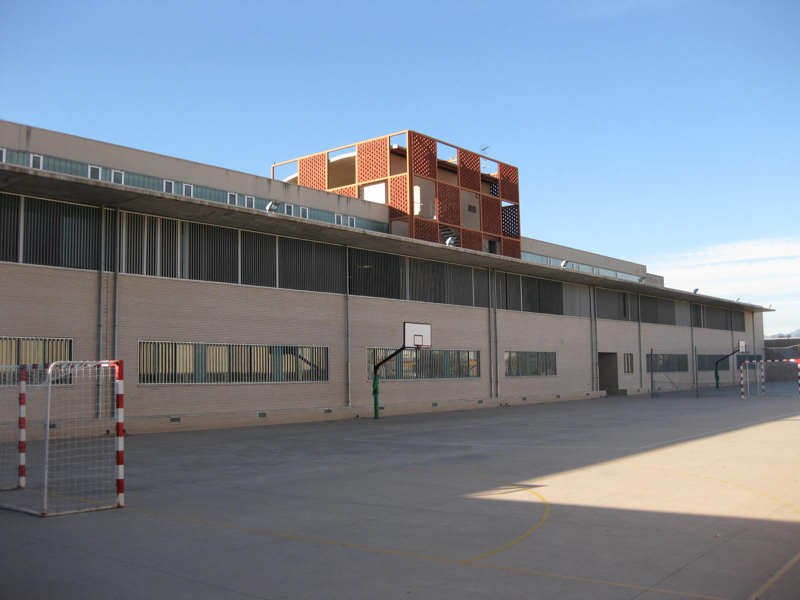 Otherwise, the centre distribution has others functional advantages for example that teachers can watch over children because the sport area is surrounded by the classroom building. 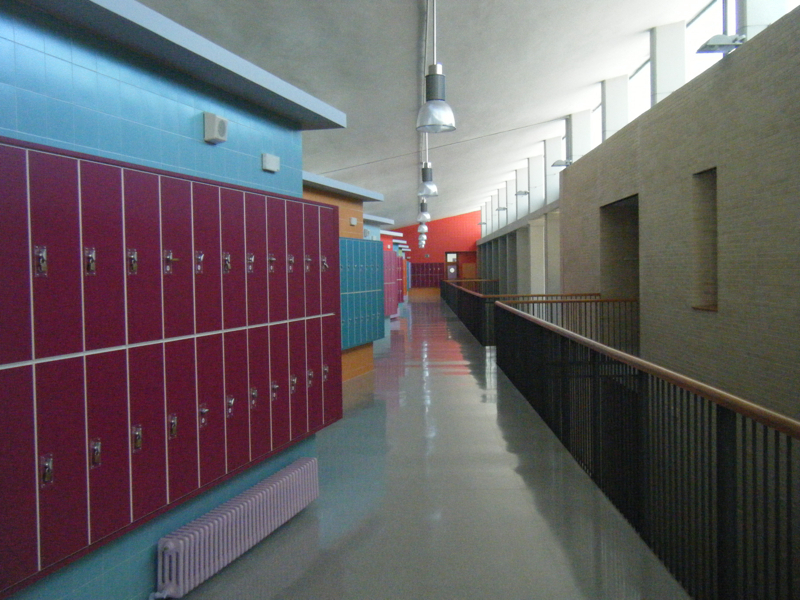 Dining room and kitchen are linked to the classrooms by a bridge-connection, which in turn is the main gate of the school. 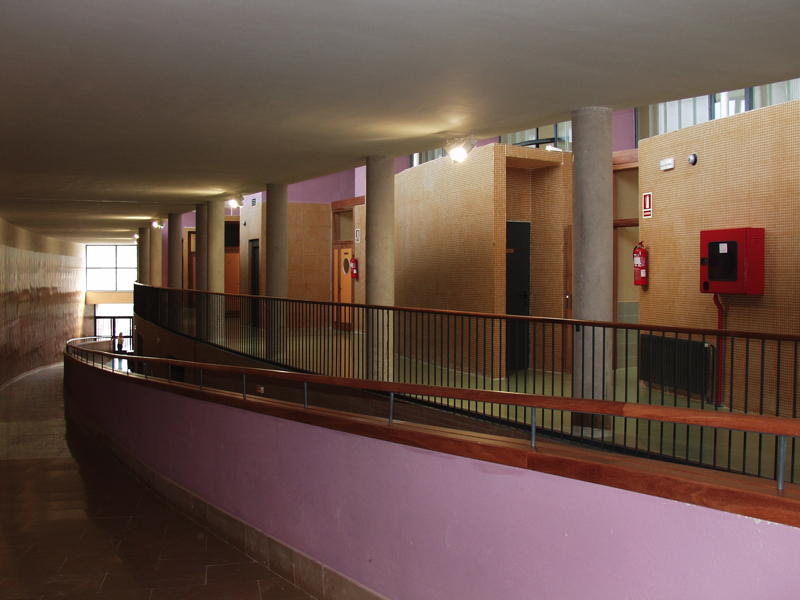 The link between the primary and secondary education represents the distribution key-point. 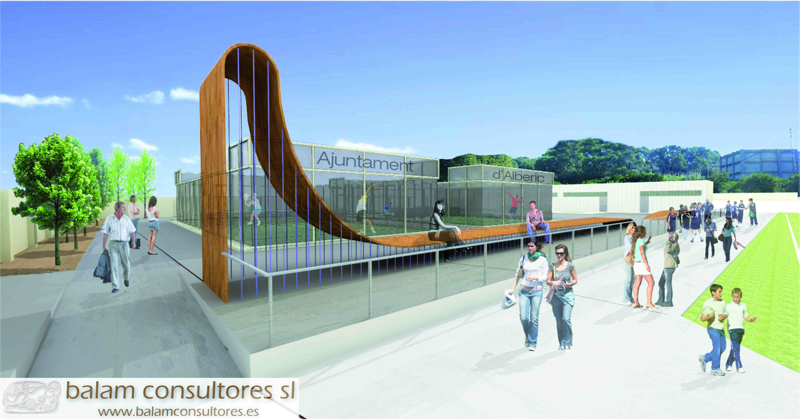 We have tried to balance all the program/project requirements, which demanded to save a big space for sport uses. 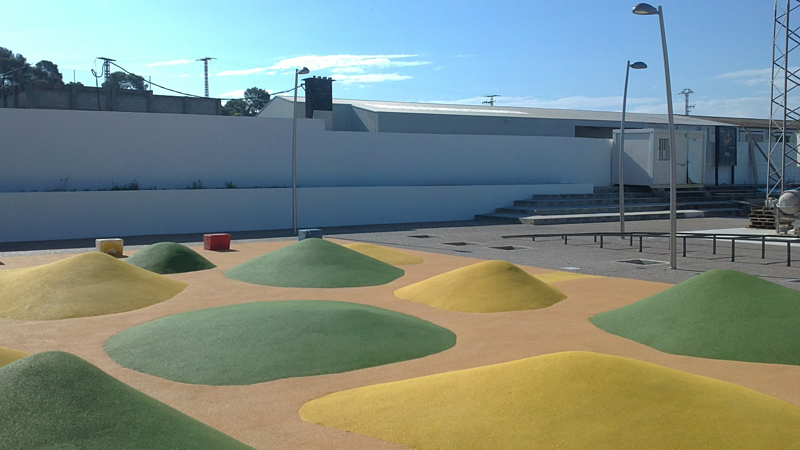 In these sport areas, we have developed small green places that break the continuity. 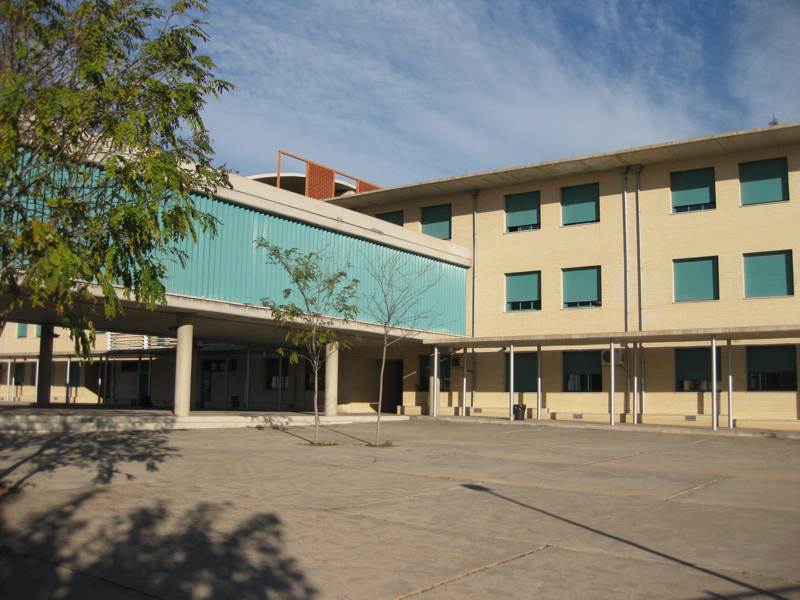 The first floor connections and an optimal distribution of the spaces make the school enlargement very functional. 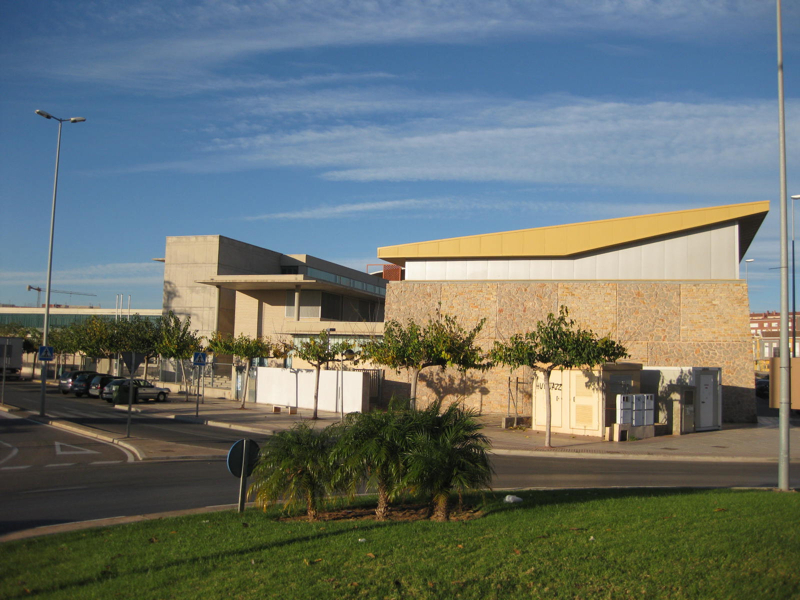 The singular shape of the gym building stands out over the other volumes. 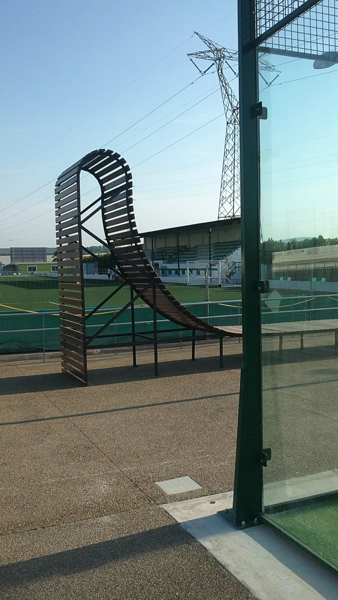 The recovering of the North area of the football stadium complements the current uses of the local athletes. 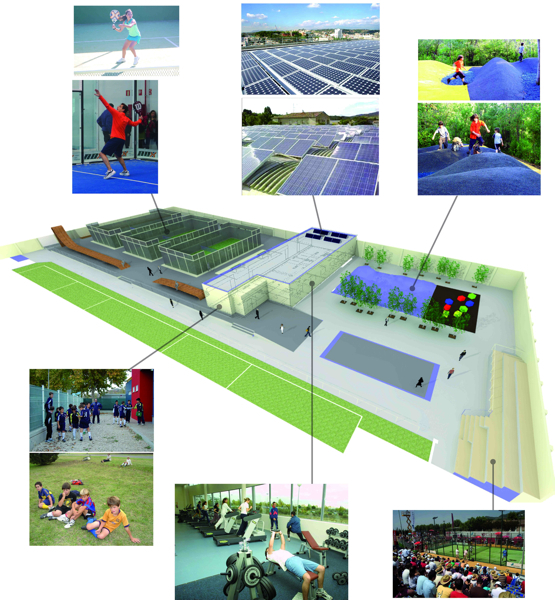 The technical team guide the construction of a changing room building and other sport facilities like paddle, table tennis and badminton as well as boccia for disabled people. 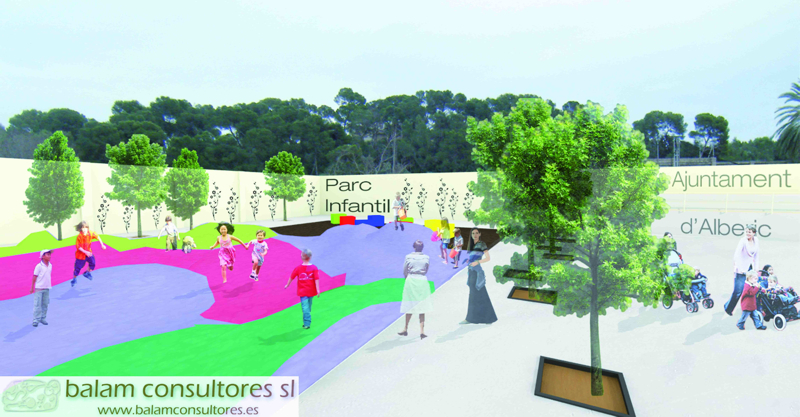 The project is completed by the construction of a park for children with sinuous mountains and modern urban furniture.